When it comes to visual map styles, there are always some people, who worship paper maps. In case of United States, it’s about USGS topo maps, in the UK it’s about Ordnance Survey, in case of Russia - about Soviet military topo map (slang name “Genshtab”, which means “General Command”). These people always think, that symbology of these maps is something absolutely superior, because professional cartographers were working on it for many years to make it effective. Which is true, but barely relevant to digital cartography. Any professionally developed map style is always based on several factors: main use of specific map type, map scale (level of details), media (paper or screen). Exactly by this reason, there are many different professionally developed standards for civilian topographic maps, hydrographic maps, military maps, aeronautical charts (and they are different, depending on altitude), marine nautical charts. In certain cases, for example - in case of nautical charts - IHO standards are universal (see IHO download page, especially - S-4 document), since it’s considered safer to have uniform styles. Map media played huge role in case of printed maps. It was too expensive and hard to use high-resolution full-color printing before. Low resolution full-color printing is completely unacceptable for maps, since large raster dots distort small objects easily. That’s why paper maps were (and still are in some cases) printed with so called “spot colors” - inks of predefined colors (like black, brown, blue, green, orange, red, violet). And that’s why paper map styles were developed having this and only this technology in mind. At certain grade, it was true for the first digital maps too, because transflective color LCD screens were far from ideal in color reproduction and their real usable color palette was limited by less than sixteen colors. Everybody who tried to make own styles or maps for those very first Garmin or Magellan GPS devices with color LCD screens should remember that perfectly. But modern display screen is a high contrast full-color output device, which is at least two times better in terms of contrast than common printed matter. Therefore, it is easy to use more colors and shades for map style without compromising readability. There is no risk of bad color registration (when outlines of different colors are shifted relatively to each other due to bad printing machine setup), so we can use really thin lines, if we want to. Since high quality printing became more available, technical limits of printing process are also way wider now than it was back in fifties, when majority of paper map standards (which are still in use) were initially developed. 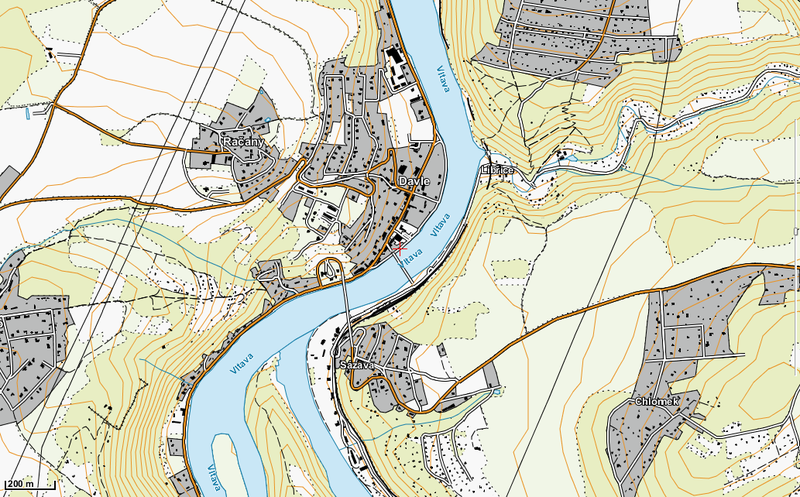 You can check out Spesifikasjon for skjermkartografi - specification for Norwegian maps, issued by national mapping agency. It’s perfect example of more or less full usage of color for different map features, which allows to put more information on map. Purpose of any map style is the most important factor for its development. It is more obvious for people, when we comparing topographic and nautical charts, but somehow it’s not that obvious when it comes to military and hiking maps. Army has own tasks we all know about. That’s why Soviet military maps have different symbols for buildings made of wood and stone, because stone houses are fireproof. Same thing goes to roads - they are classified by several factors such as surface and width to give officers an idea, if particular road can be used by tanks and what will happen to it after they pass there. Is it enough for hiker or bicycle rider? Most likely, no. But it’s acceptable in case if there is nothing better (like in case of Russia). To get some idea about maps style, designed for outdoor use by pedestrian, anyone should check out International Specification for Orienteering Maps and some orienteering maps available online. Orienteering maps are perfectly readable, but in the same time, they giving you huge amount of information about landmarks, terrain, vegetation and other things in very dense “package”. They even showing features like “wood, passable in one direction” (dense planted forest), “crossable and uncrossable pipelines” and many others. Is there anything like that on maps, intended for tanks? Obviously, no. Sure, anyone is free to use whatever map one likes and to reproduce its style in MapCSS, SLD or QML, but let’s avoid doing it blindly or based on limited knowledge. You are right about design concepts from printed maps not being directly transferable to digital maps but i think you are wrong about the primary reason being different capabilities in color representation. This offers additional possibilities for digital maps (although designers often lack experience with color perception to put them to good use) but it does not prevent traditional techniques from printed maps to work on screens. What makes many classical map design techniques unsuited for digital maps is the lower resolution of display devices. This problem is somewhat reduced with newer high resolution mobile devices but since hardly any map style is designed exclusively for those it is still a very widespread and fundamental problem. I discussed this in context of patterns some time ago but it also applies in many other areas, in particular with dense line features like contour lines, rock hachures etc. English is not my first language, but I can’t figure out, where exactly did you find anything about color representation as primary factor. My view is that these factors (and some others I didn’t mention, such as multi-scale representation of digital maps, for example) are more or less equally important. So, what I really dislike in any discussion is to argue about things I didn’t actually say, but my opponents somehow managed to read between the lines. And speaking of resolution - thinnest line in Soviet topo map standard is about 0.25 mm wide, while on modern display, pixel pitch is usually 0.2 mm or even better. Smartphones have twice smaller and even finer pitch. Therefore, we can’t really talk about seriously worse resolution. As I said before, digital screen has no problems with color registration and color trap, which means we can use styles which are close to impossible on printed maps, such as semi-transparent hairlines (for minor horizontals, for example, to avoid clutter) or differently colored hairlines right next to each other. So, even having a bit worse resolution, it’s possible to compensate for it at significant grade, using extra freedom and advantages of digital screen. Indeed, USGS uses same styles for new GeoPDF topo maps with layers and so on, as they used for printed ones. But it only means that it serves them well enough. In more extreme cases (Soviet military topo) it can’t serve perfectly for any other purpose than war, since it lacks all kinds of important information. And it’s not about representation or style, it’s about purpose. And even in perfect case of USGS maps, there is certain way for improvement. For example, semi-transparent horizontals will allow to use layer visibility switch less than you have to use it now, because currently, solid dense horizontals do make it look cluttered. I am sorry if i misunderstood your focus - you wrote mostly about the subject of colors so i assumed you consider this the most important difference. As i said to my knowledge there are no digital map styles developed exclusively for high resolution devices - in other words: all digital map styles so far take into account the specific limitation of low resolution display devices. In his recommendations for contour lines Eduard Imhof specifies line widths down to 0.03mm by the way and specifically discusses the difference in results between reducing line with and varying the line color. These nuanced possibilities do not exist with digital displays if the line width approaches or even drops below the pixel size. It will however indeed be interesting to see how high resolution displays will extend the design possibilities of digital maps. But limited color set can be also a design choice. It can help to bring some kind of systematic thinking to the map key. 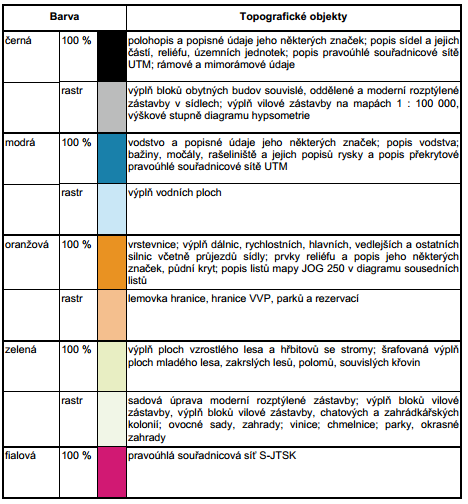 For example, Czech military map used 9 colors only. Unlike on OSM base map here I can identify features at the first glance without looking to legend. Being able to identify features in case when you have more colors is not that big problem, if colors are picked logically. Often, you can easily guess, what’s the meaning of some of them just by looking at map. Like in case of residential and non-residential areas. Or in case of conifer and broadleaf woodland (when conifers have darker green fill color). For sure, if colors and symbols are randomly picked, it makes a mess. But military map styles were created for only one purpose keeping in mind making them cheap, not to represent more information - military maps just don’t need much of it. In addition to that, I should mention, that your own perception of military map as of something obvious is based on your own experience and knowledge. For some person, who had no experience with it, some things are not that obvious. For example, all features like fields and wood have borders (dotted line). You know that it’s just a symbol. But someone can get an idea that it could be some soft of drain trench or something. And at certain scale, it’s hard to see the difference between these dotted lines and small rural houses, aligned in line along the road. So, military maps are obvious only for those who got used to them. They are not even close to any good example of design in general, they are good only in given circumstances. Colour; There is a fair proportion of the population that have difficulty distinguishing colours. Low contrast colours are harder to distinguish between each other. Line widths; Thin lines are hard to see, especially at a quick glance or in bright sun. Symbols; These are fairly ‘standard’ now .. it is only copyright issues that annoy. Evolution; Paper maps have evolved over time … probably as good as they are going to get now, Electronic maps are still evolving - so there will be divergence at present while different ideas are tired. I have all the maps types/makes you mention .. plus Australian ‘Natmaps’, ‘Geoscience maps’ (both govt.. form the same department with name changes by politicians), Westprint maps, Hemma maps and probably more that I cannot remember now. They all have different styles. But the basics are very similar - small colour range so easy to distinguish each colour, minimum and maximum line widths - so you can see them easily and they don’t dominate too much. Copying a paper map style .. makes it easy for those familiar with that style. But as you point out the styles are country specific .. so not that advantageous for a world wide map. But using the basic ideas of colour, line widths, symbols where these are uniform across a wide source of these paper maps is a good idea - these would be well evolved and widely recognized.